Week 10 of our program, wow this is speeding by! As we quickly approaching Demo Day, the attendee list is growing daily and so is our excitement to showcase the 10 startups in our program and the cumulation of all their hard work at the Bushnell on April 26th. This week’s lessons included foundational items that are important, especially when your business is moving quickly. Amit Choudhary, CFO & Executive VP at Financial Services Global SBU from Capgemini came to share some key tips with the startups on how to look at their business from a financial perspective. Understanding the key levers in how your business may grow, create scenarios to understand the “what if” situations and track how you are performing against the financial plan you have put together. Your actuals versus planning will be a great comparison for your board and potential investors. He was joined by Shiva Balasubramaniya and Krishna Shanmugasundaram from Capgemini. Data Privacy- Ben Wiles from UKS reviewed the regulations that require your applications and websites include privacy policies, variations that apply by state and how you need to handle any data breaches if they occur. Ben has a way to make sure he explains the regulations in a way all can understand. He also discussed HIPPA regulations including applicability, substantive and de-identification and for our startups who deal with health information, claims or raw data, this was very helpful. Pinkesh Patel, the Managing Director, Global Head of Digital Product Design and Delivery for AIG shared his views on how to create a simple design to make sure your efforts and resources add value. He covered inclusive design, which is often overlooked when creating a new platform. He put forward a few reminders, we often introduce exclusions when we solve problems with our own bias, you can learn from a fresh diverse perspective and be sure to focus on what’s universally important to all humans. One of the favorite slides was a quote which was appropriate today as when is was written in 1911 “Civilization advances by extending the number of operations we can perform without thinking about them.” Alfred North Whitehead, British Philosopher. Thanks to Bill Sullivan, Head of Market Intelligence Capgemini for sharing in our discussions and introducing us. 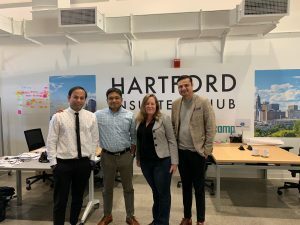 Hartford InsurTech Hub 2019 cohort met Upward Labs Cohort on Tuesday night this week. 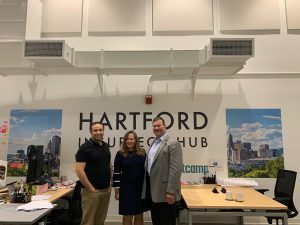 We are excited for the interaction between the Smart Building & Aged Care startups who will be living, working & playing in Connecticut’s capital city as part of the first-ever Upward Labs program! Have you ever attended a conference will all intentions of networking with attendees and at the end of the conference realize you were just with those you people you already know. Do you know there is an app for making sure that doesn’t happen? To make sure proper networking happens at Demo Day, Book your 1:1 meeting ahead of time. The code to find our event attendees on the Brella app is hartford2019. If you are not quite sure who might be relevant for you to connect with, the Brella algorithm will make suggestions! Sign up for Brella now. Building and investor network is important to make sure you have connections when you are ready to raise funds. Andrew Sagon form HSCM discussed how to best position your business for investment and investor metrics for evaluating a business model for both fee-based (non-insurance models) and risk bearing insurtech startups. After, we spoke with Toan Huynh and Kavi Karunadeva of Information Venture Partners on what they look for in companies, how to navigate cap table dynamics as you add advisors and investors to the cap table, venture fund ownership requirements, and we talked in detail about the process and reasons behind a recent investment that they made. In support of other accelerators and startups activities, we attended the ABCT event in NYC, hosted by Jessica Dodge of CT Next. It was a showcase of dozens of companies and brought together the early stage life sciences and digital health communities. 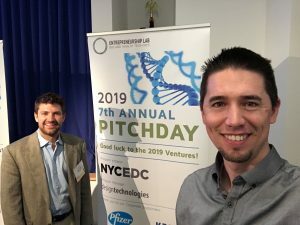 We heard early stage pitches from companies from a range of areas including pharma, therapeutics, drug delivery, diagnostics, medical devices, digital health, and wellness. The event was a fast-paced pitch style with continuous pitching for companies with minimal breaks. Tiring, but very interesting! Since automation is happening in many areas, we welcomed MassRobotics to discuss how automation and insurance are connected. There are many examples in their portfolio of companies that insurers need to be aware of how to handle associated risks for e.g. robotic surgical devices, helicopter stability, self-driving cars, water pipe inspections, workspace robot collaborations. MassRobotics is a non-profit organization serving as the innovation hub for robotics and connected devices in Boston. By working with diverse local talent, they are working to bring about the next global evolution of robotics. 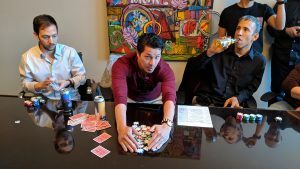 Although we do not teach poker as a way to raise capital [wink emoji], we do find it a great way for the startups to bond and focus on something else to clear their minds. 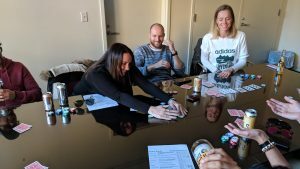 A mix of newcomers to the game and a few experienced card sharks resulted in an interesting evening of “poker face” and bold moves. A few large interim winners make for great photos collecting the chips. 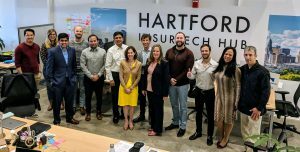 A leader in the world of Insurtech, Sabine VanderLinden has been in Hartford all week sharing her knowledge of InsurTech trends globally, lending her expertise, making connections for the startups and rolling up her sleeves to help out for Demo Day.